When officials in Clinton, CT determined that a renovation on the area’s aging public high school, The Morgan School, would cost more than a rebuild, a new 140,000-square-foot building was constructed. Officials relied on Jaffe Holden Acoustics and Masque Sound, a theatrical sound reinforcement and installation company, to design and outfit the school’s auditorium, gym, and lobby with the latest AV technology to meet today’s standards. The main auditorium system is comprised of a Bose RoomMatch System, which utilizes selected coverage pattern line-array modules to avoid unwanted reflections from walls and other surfaces. The new school boasts what is referred to as a ‘hub’—a gathering area, floor-to-ceiling windows in the second- and third-story classrooms, a 210-seat open food-court style cafeteria, as well as a learning commons/library. The installed system at The Morgan School’s main auditorium features both audio and video solutions, while the gym and lobby portions of the project are comprised of small independent audio-only systems. The main auditorium system is comprised of a Bose RoomMatch System, which utilizes selected coverage pattern line-array modules to avoid unwanted reflections from walls and other surfaces. The system is made up of left, right, and center arrays with subs at the top. Fill speaker zones consist of front fills, under balcony, and over balcony speakers. All amplifiers derive their signal via Dante from the Symetrix DSP. The installed infrastructure provides interconnectivity throughout the auditorium for audio, video, data, and speaker signals. 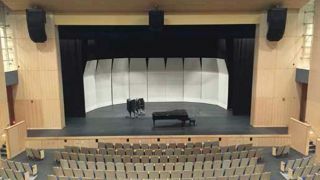 Custom panels are located on the stage, in the catwalk and throughout the auditorium. These panels allow for the ultimate flexibility of the system as a whole. “The auditorium allows both a skilled and non-skilled operator to use the system via the Crestron control system,” said Ben Bausher. A Draper Paragon series projection screen was installed, allowing for a 16:9 aspect ratio, while a Panasonic PT-DW17KU projector and ET-D75LE20 lens handle the projection duties. The two- or four-lamp modes on the projector are controlled by a Crestron control system, as well as the power mode of the projector. The gym and lobby spaces feature multiple speaker zones, wireless microphones, assisted listening systems, and custom input panels. Both are made up of Symetrix DSP, Lab.gruppen amplifiers, and Shure wireless systems. While the gym utilizes Fulcrum Acoustic speakers, the lobby uses JBL ceiling speakers. These systems use Symetrix ARC-2e remote controls to allow end user control of aspects of the audio system.